Growing up in Colorado I’ve developed a love for great Southwestern food. I’ve been totally spoiled by farmer’s markets with roasted Hatch chilies and homemade salsas made with chilies plucked yesterday, not to mention the great hole-in-the-wall restaurants that just happen to have incredible tamales or chili rellenos. In my own kitchen, I love to incorporate all the deep flavors of the Southwest in simple dishes. I recently made rolled enchiladas, and they turned out OK, but this casserole version of the classic dish is a much easier way to get all the yumminess with half the work. 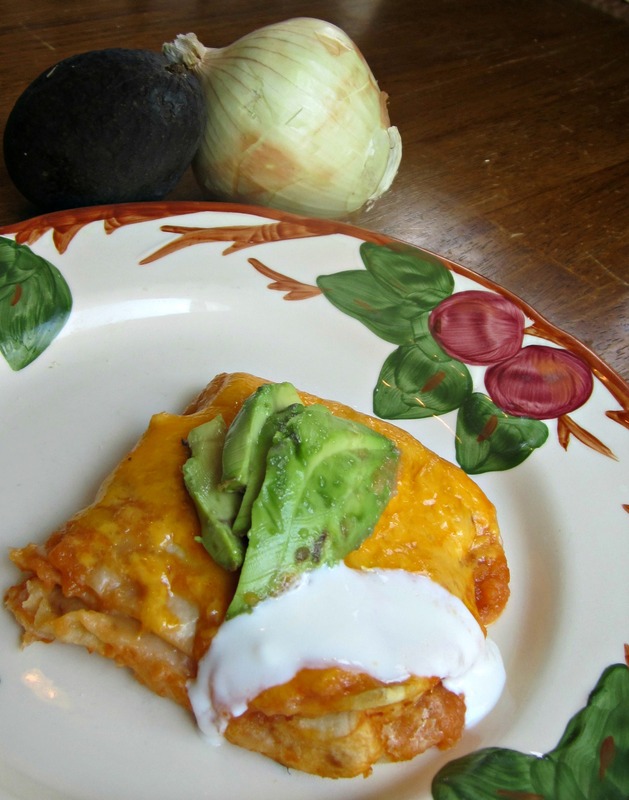 Perfect for a Sunday dinner or a potluck lunch, this enchilada casserole is sure to become a favorite! 1. Preheat your oven to 350 degrees. Season your chicken thighs liberally with salt and pepper on each side. Pop those into a warm pan over medium-high heat for 5 minutes each side. Once the thighs have a golden-delicious color to their skin, place the pan into the oven and bake the thighs for about ten minutes until cooked through. 2. Once cooked through, remove the thighs from the pan and place on a plate in the freezer so that they can cool quickly. Don’t worry, you won’t freeze them, but you’ll want them plenty cool for when you remove the meat from the bones later. 3. Drain the grease from the hot pan that you just pulled from the oven, but don’t wash the pan yet. Over medium heat, saute 3 of the cloves of garlic and 1/2 cup of the chopped onions until the onions are translucent. 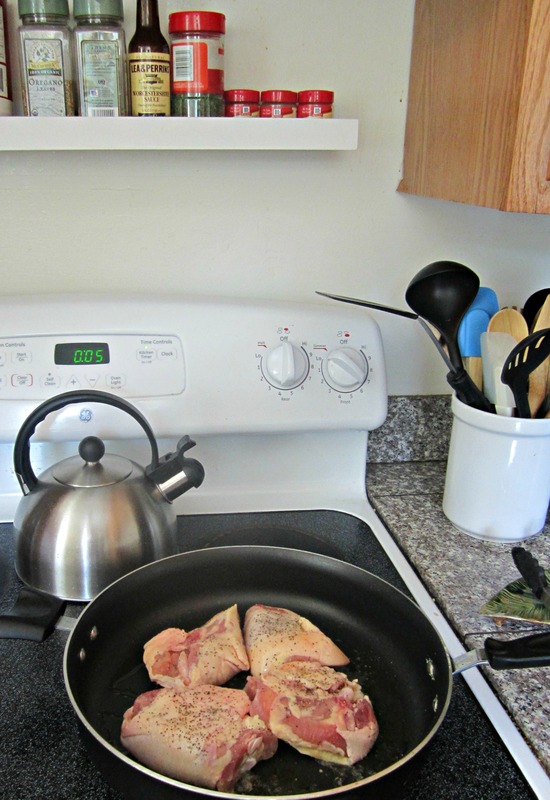 As you are sauteing the veggies, be sure to scrape up the tidbits the chicken left behind in the pan. These little bits are packed with chicken-y goodness and will give your filling a lot of good flavor. 4. While the chicken is cooling and the veggies are cooking, mix together the cream cheese, cilantro, chili powder, cumin, salt and pepper in a large mixing bowl until well blended. Once the veggies are cooked add them to this mixture. 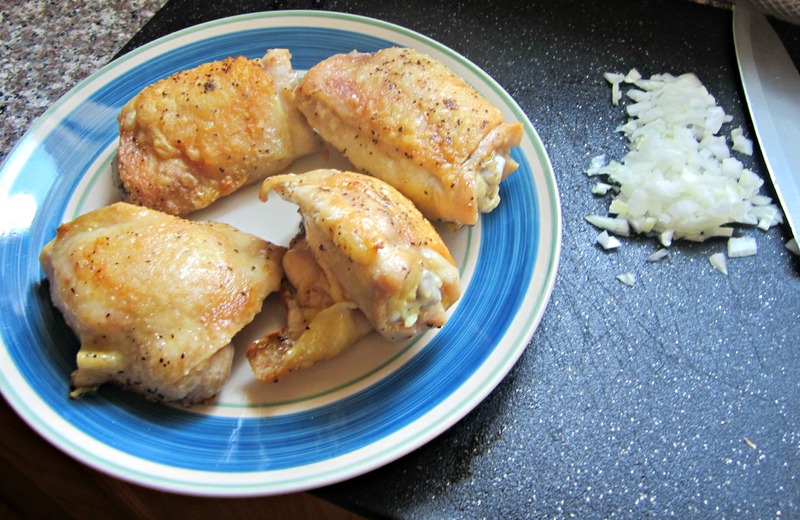 Take your chicken out of the freezer and remove the meat from the bones. 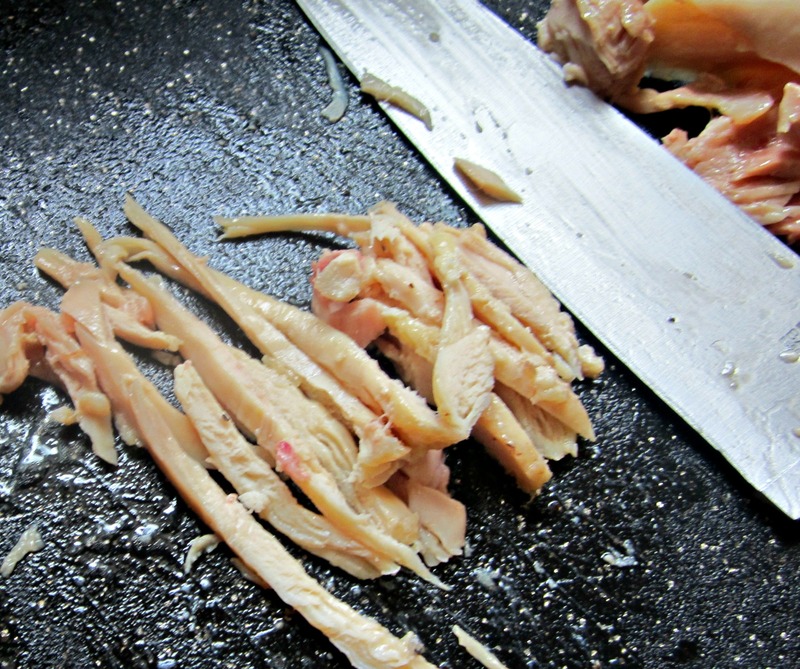 You have the option to shred the chicken (tasty but tedious) or cheat like I did and cut the chicken into fine slices. Add the chicken to the cream cheese mixture and mix until chicken is fully incorporated. 5. In a large saucepot, saute the remaining 1 1/2 cups onion and 3 garlic cloves. After a minute or two (these veggies don’t need to be cooked through), add the salsa verde, water, stock and tomatoes. 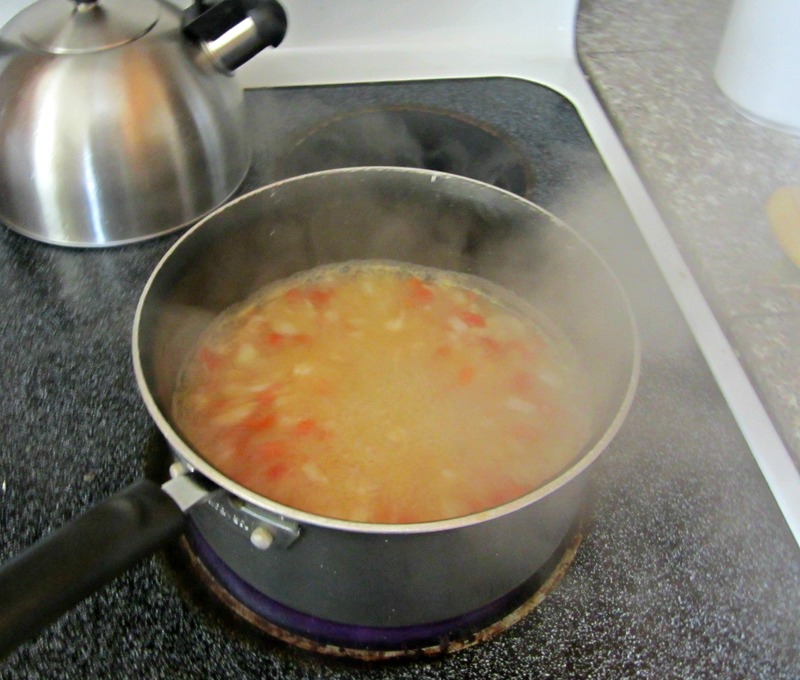 Bring to a boil, then reduce heat and simmer for 20 minutes until your sauce reduces by about half. 6. Once sauce reduces, pour mixture into a blender and puree until smooth. Careful here! Make sure you start the blender on a low speed and work up to the puree setting. I sent sauce flying all over the kitchen because I started the blender too high. Hey-I don’t call it Messy Kitchen, Happy Belly for nothing! 7. Preheat your oven to 325 degrees. While your oven is warming up, heat a large pan to medium and pop a tortilla on there. Do not use oil to coat the pan but you could use some cooking spray if you’re worried the tortillas will stick. Give the tortilla about a minute and a half on each side so that it crisps slightly and develops a lovely golden tan. Remove the tortilla from the heat and cut into quarters. Repeat with the remaining tortillas. 8. Now that your filling, sauce and layers are complete, it’s time to assemble the casserole and blow everyone away. Pour 1/2 cup of sauce into the bottom of a 9 x 13″ baking pan. Lay a single layer of tortilla slices on top of sauce so they create a nice bed for your filling and mostly cover the sauce. Spread 1/2 of the filling on top of the tortillas, sprinkle a bit of cheddar cheese on top of the filling and then add another 1/2 cup sauce on top of the cheese. Repeat the layer one more time, and then add one more layer of tortillas. Top the tortillas with any remaining sauce and sprinkle cheddar cheese on top of that. Bake for 15 minutes at 325 degrees and let stand for 10 minutes before slicing. Garnish with avocado, sour cream or cilantro, or all of the above! Enjoy! Look at the fancy new site! So awesome! I think it is time for an iron chef posting for old times sake! I miss seeing your sweet face girl! Thanks Heidi! I think we are WAY overdue for an Iron Chef night! Miss you too! Have a great day!